The Detroit Red Wings finished fast and furious on Thursday night, scoring thrice - that's THREE times - in the final minutes of their match with the Pittsburgh Penguins, including the OT game-winner off of Justin Abdelkader's stick. For the Penguins, the game didn't exactly start off how the team would like, as Detroit took it to the Pens, especially in the Faceoff circle. In the first five minutes of the game, the Red Wings won 5 of 6 faceoffs. Despite their early struggles in the circle, the Pens weathered the storm and after a flurry of shots on the debuting Thomas Greiss, took it the other way. Forward Pascal Dupuis found the loose puck to the left of Greiss and dished it off to Blake Comeau and the two tore through neutral ice. Detroit had four skaters in deep, leaving defenseman Brendan Smith all alone to deal with the two speedy attackers. Smith committed to playing Comeau who dished the puck off to Dupuis. Jimmy Howard didn't have much of a chance as Pascal deposited his second goal of the season inside the post to Howard's right. 1-0 Pens. Maatta gets a closer look. Six minutes later, the Pens were attacking with Comeau along the right boards when he found Olli Maatta all alone in the slot. The 20 year old Finn fired a shot which rebounded to the corner. Maatta followed his own rebound, beat the Pavel Datsyuk to the puck, cut to the net and buried a backhand shovel underneath Howard to take a two goal lead. Evegeni Malkin was credited with the secondary assist, his seventh on the season. Detroit is a team full of veterans, though, and an early two goal deficit would not faze them. Case in point, defenseman - and perennial single-digit goal scorer - Niklas Kronwall channeled his inner Datsyuk, dangling around Patric Hornqvist and firing a wrist shot past a light screen beyond the reach of Greiss's blocker. Darren Helm, who found Kronwall all alone from along the near boards, was credited with the lone assist and with five minutes to play in the first period, it was 2-1 Pens. Midway through the second period, the Penguins would retake a two-goal lead when Simon Despres caught Detroit on a line-change and sent a cross-ice pass to Chris Kunitz. Kunitz carried into the zone alongside Hornqvist and captain Sidney Crosby. Hornqvist cut to the middle, stacking Kronwall and fellow defenseman Jonathan Ericsson, allowing Kunitz to fire a wrist shot past the glove of Howard. Again, the Red Wings are a not a team to fold. Trailing by two with less than three minutes to play does not change that. Cue Henrik Zetterberg. At the 17:21 mark of the third with Howard pulled in favor of an extra attacker, the captain of the Red Wings buried the puck over the glove of Thomas Greiss. The sequence began as Detroit smartly spread out their wingers to draw the Penguins defenders to the boards, allowing Zetterberg to accept a clean pass, power around Brandon Sutter and face Greiss alone. Danny DeKeyser and Kronwall would receive assists on Zetterberg's third of the season. Exactly two minutes later, Kronwall himself would strike again to knot the game at three. After inexplicably finding themselves unable to find the empty net after 30 seconds of offensive zone time - and thanks largely to unneccesary "play time" - Detroit counter-punched, breaking into the zone with the puck on Datsyuk, then Zetterberg's, stick. Okay, so Kronwall scored 11 and 15 goals in successive seasons (2010-11 and 2011-12) once. In a frustratingly masterful sequence, Zetterberg carried the puck deep into the Penguins' zone and found Pavel Datsyuk to the right of Thomas Greiss. 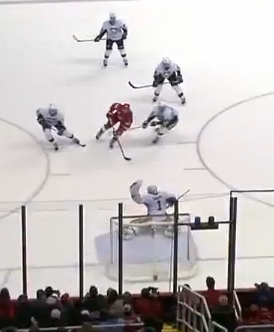 Instead of taking the shot, Datsyuk, knowing everybody was keyed in on him, turned and fired a pass to the trailing Kronwall. Kronwall easily buried the puck into the net with just 39 seconds to play in regulation, forcing the game into overtime. The momentum had clearly swung going into the extra time. The period began with sloppy puckhandling as neither the Penguins or Red Wings seemed to be able to build any sustained tempo beyond "slow." Exhibit A: Christian Ehrhoff on the rush. As the teams settled down, that changed a bit and the pace picked up. How does he not shoot? The lost opportunity of the game came when Kris Letang found the puck on his stick on a rush into the Detroit zone. Chris Kunitz had found Letang trailing the play, all alone at the left point. The defenseman opted to attempt a pass to Evgeni Malkin instead of taking a shot, despite Howard's struggles with one-on-one situations to that point. This ill-advised decision ended the scoring chance as the pass was broken up and just a minute and change later, Henrik Zetterberg was able to deflect Paul Martin's clearing pass from behind the end line right to the blade of Justin Abdelkader. The rest is history, as Abdelkader beat Greiss on the blocker side, securing two points for the home team in a 4-3 thriller. The Penguins, now 3-2-1 on the season with 7 points, find themselves three points behind current division leaders, the New York Islanders. Their next game will be Saturday in Nashville, an 8 PM start against James Neal and the Predators on RootSports Pittsburgh. Nick Spaling went 2-for-2 in the faceoff circle, winning both his draws in the Pens' defensive zone. Both draws were during special teams play, the first while short handed, the second while on the power play. With the NHL's scoring change from the Philadelphia Flyers game, Pascal Dupuis now sits at 399 career points. In 843 games, Dupuis has scored 184 goals and assisted on 215 others. His career has seen him spend time with Minnesota (6 yrs, 334 games), the New York Rangers (1 yr, 6 games), Atlanta (2 yrs, 79 games) and Pittsburgh (8 yrs, 424 games). 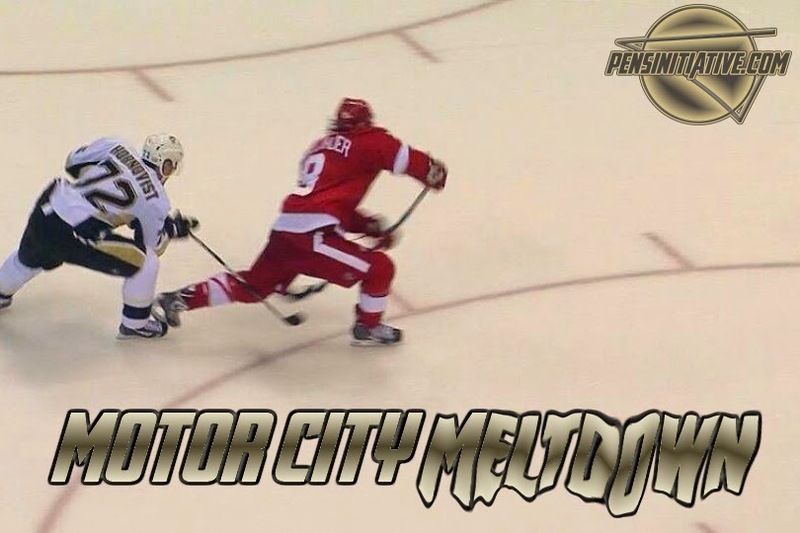 Detroit outshot the Penguins 31-26 in the game, including 8-4 in the 3rd period and 2-0 in OT. The Penguins held the edge in shots after the 1st, 16-9. Both teams went 0-for-3 on the power play. Or 3-for-3 in penalty killing situations if you're the "glass half full" type. Kris Letang logged the most ice time of any skater with 25:07. He registered 3 shots, a blocked shot and 2 takeaways in that time with a Plus/Minus rating of -1.